Right now Americans pay an average of $8950 per year1 to own and operate their cars. They pay this to have access to their cars 100% of the time, but only actually use their cars about 4% of the time.2 By the time autonomous vehicle technology is fiscally available to the middle class, Americans will already have been using it for a decade or more through Uber and other ride sharing services. Once consumers get used to this cost savings enabled by Uber operating inexpensive autonomous vehicles, they will eventually question why they’re spending ~$9K/year3 to have a car sit unused in their garage 23 hours a day when they could be using Uber’s on-demand shared fleet for a fraction of the price without any additional inconvenience. In truth, Uber will actually be more convenient than private ownership because every drive someone engages in will not conclude with spending time looking for parking. This isn’t a major consideration in the suburbs, but it is a huge differentiator in urban areas. This transition from private car ownership to shared usage of vehicles will change every aspect of the consumer’s life, but it’s not going to happen overnight. Despite the fact that America’s “car culture” is waning,4 we do still have a tremendous, collective cultural love for our automobiles. Also, just on a practical note, right now Americans keep each car they buy about 5 years5 if one averages new and used car sales. So, for both cultural reasons and consumer purchasing cycles, this disruption won’t happen as quickly as the transition to MP3s or smartphones or other small scale personal electronics. 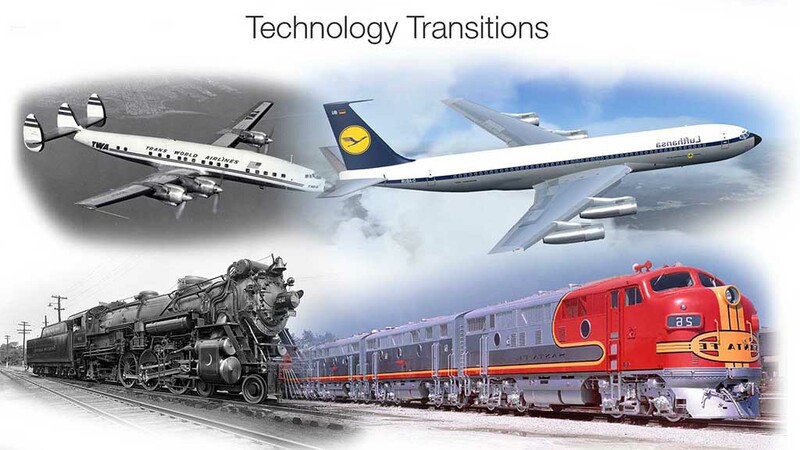 If you look at adoption rates for major transportation technologies, like the transition from aircraft piston engines to jet engines or steam to diesel electric locomotive technology, they both took about twenty years. So the timing isn’t definitively known right now, but regardless, it’s going to happen, just not as fast as it does with consumer electronics. Every time consumers are faced with the choice to replace their $9K/year6 car or just use Uber’s autonomous fleet for a fraction of that price, they’re going to increasingly just decide not to buy another car. There are consumer trends right now that already predict this change. 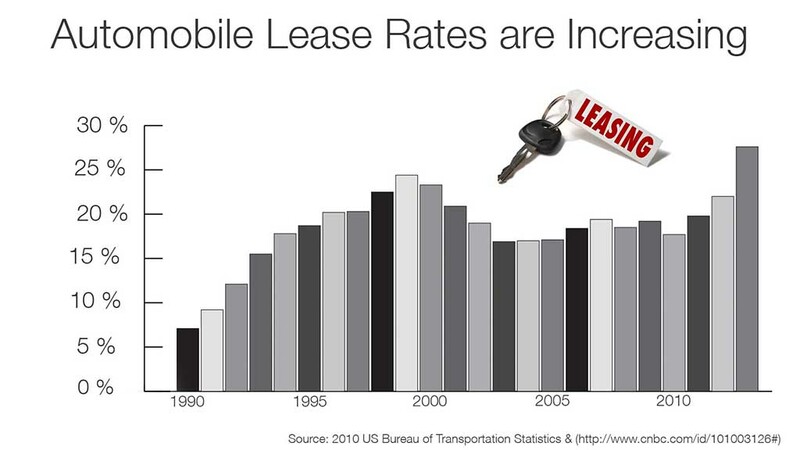 This is a graph that shows the rising popularity of leasing over buying automobiles. 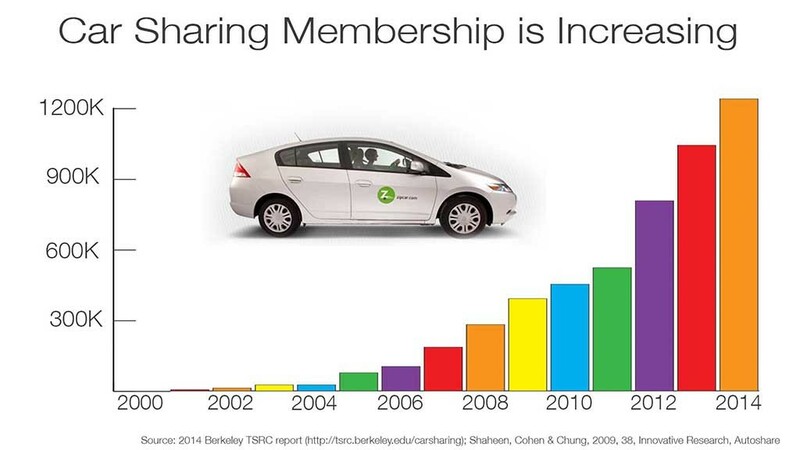 This is a graph that shows the rise of car sharing services in urban areas. What we learn from this is that urban dwellers don’t necessarily even want to have physical possession of their cars. 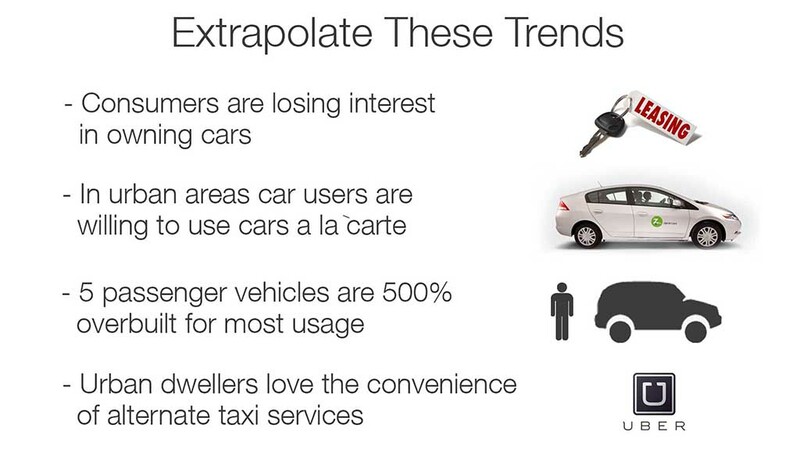 These consumers are increasingly happy to use their vehicles in a short term, a la carte rental fashion. Here are the trends we’re seeing. Consumers are already embracing alternate taxi services like Uber and Lyft even though they’re 3x as expensive as privately owning automobiles right now. Consumers increasingly don’t care that much about owning their vehicle. In urban areas they increasingly are perfectly happy not to have physical possession of the vehicles they use. And as we’ve seen, most car use is conducted with a gasoline vehicle that’s 500% overbuilt for what it spends most of its useful life doing. If you take all these trends and extrapolate them, and then imagine what autonomous technology could enable with respect to these trends, this is the world I see coming. Once shared transportation is conveniently available on demand at a fraction of the price of privately owning cars, consumers will eventually abandon mainstream private car ownership. At this point transportation will become a service in America rather than a product. We’ll all be using what I call The Mobility Cloud. This concept of The Mobility Cloud is one of the four most important things any reader should take away from this website. It’s the most overarching and societally impactful consequence of autonomous vehicles and it will have profound economic and societal consequences. The next section details the greatest disruption this will cause.